NEW YORK (AP) — The nation's crude oil supplies increased last week, the government said Wednesday. Crude supplies rose by 3.9 million barrels, or 1.2 percent, to 334.7 million barrels, which is 6.9 percent below year-ago levels, the Energy Department's Energy Information Administration said in its weekly report. Analysts expected an increase of 1 million barrels for the week ended Nov. 25, according to Platts, the energy information arm of McGraw-Hill Cos. Gasoline supplies rose by 200,000 barrels, or 0.1 percent, to 209.8 million barrels. That's 0.1 percent below year-ago levels. Analysts expected gasoline supplies to increase by 1.5 million barrels. Demand for gasoline over the four weeks ended Nov. 25 was 2.9 percent below a year earlier, averaging 8.7 million barrels a day. U.S. refineries ran at 84.6 percent of total capacity on average, 0.9 percentage point down from the prior week. Analysts expected capacity to rise to 86 percent. Supplies of distillate fuel, which include diesel and heating oil, rose by 5.5 million barrels to 138.5 million barrels. Analysts expected distillate stocks to decline by 1.5 million barrels. In morning trading benchmark crude rose $1.40 to $101.18 a barrel in New York. The Port of Rotterdam and Shtandart TT signed a long-term agreement for a new major crude and products oil terminal at an area exceeding 55 hectares at the Tank Terminal Europoort West (TEW). Shtandart is owned by the Russian Summa Group (75%) and Dutch VTTI (25%). Shtandart TT will build 3 million m3 of storage facilities allocated for Urals crude oil and oil products. Investments are expected to total $1 billion (€0.75 billion). The new terminal will operate as an open hub terminal creating a trading platform for Urals crude oil. Construction is expected to begin in 2013 resulting in an operational start-up in 2015. VTTI is a 50/50 joint venture owned by Vitol Holding B.V. in the Netherlands, and MISC Berhad of Malaysia. It owns and operates 11 petroleum product terminals with a gross combined capacity of nearly 6 million m3. 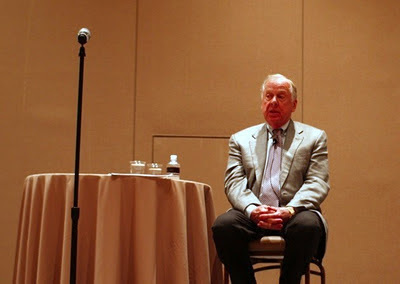 Since the summer, natural gas supporter T. Boone Pickens (pictured) has been in an energy fight with the Koch brothers. Think of it as a battle of the conservative billionaires to see who can get more money from the federal government. 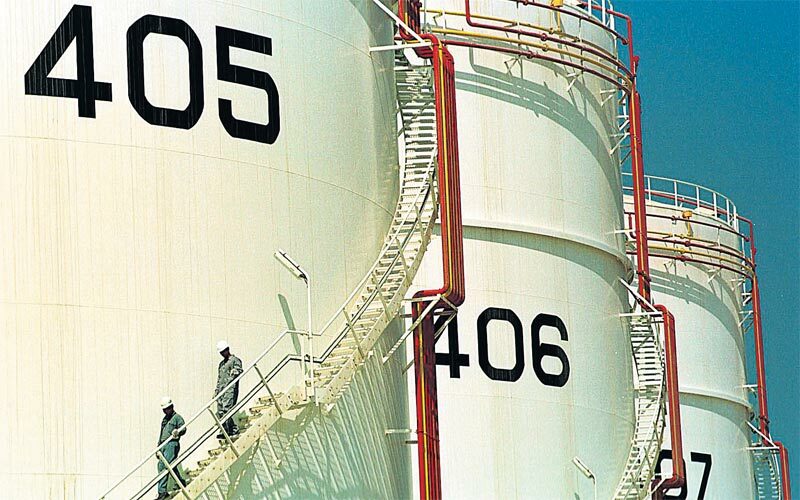 Koch Industries imports 61,000 barrels of OPEC oil a day to their Corpus Christi refinery. They're the third largest recipient of subsidies for ethanol, they're in the chemical business and the fertilizer business. So everything I do could affect them in some way. They're against me. I know Charles and David Koch. I asked them to talk to me about this subject; they would not do it. They would not return my phone calls. When I was one of their biggest customers in 2005, I heard from them and was entertained in their home in Wichita, but now (they) don't want to talk to me about it. They've gone and tried to peel off all the co-sponsors of the bill that they can. While they knocked out 14 I was getting 16. They spend a lot of money to do this. They're working for the Kochs, I'm working for America. I want an energy plan for America, they want an energy plan for the Koch's. This past May, Charles Koch wrote an op-ed that claimed that Picken's call for natural gas to get subsidies "well-intentioned but misguided" even as it said that Kock didn't even want the ethanol subsidies he was collecting: "Because ethanol use is mandated, we were compelled to be in that business. We still oppose ethanol subsidies and mandates even though some of our businesses would benefit from them." A spokesman for the Koch brothers wrote to Congress in June that "We do not believe government should be picking 'winners and losers' in the marketplace." Well, of course you don't. Not once you're already winning. (Bloomberg) -- Waha Oil Co., a U.S.-Libyan joint venture, resumed crude output at a rate of 16,000 barrels a day from two fields, representing 5 percent of its total production capacity, Libya’s National Oil Corp. said on its website today. The Tripoli-based company plans to raise its output to the maximum level “as soon as possible” after pumping crude from the Dahra and Samah fields, Libyan state-run NOC said. Waha Oil was producing 350,000 to 400,000 barrels of crude a day before protests erupted against Libyan leader Muammar Qaddafi, roughly a quarter of the country’s pre-crisis output. The company is 59 percent owned by NOC, with the rest held by ConocoPhillips, Marathon Oil Corp. and Hess Corp.
Libya, holder of Africa’s biggest crude reserves, is currently producing more than 750,000 barrels a day. The North African country pumped 1.6 million barrels a day before the rebellion broke out in February. To contact the reporter on this story: Ola Galal at ogalal@bloomberg.net. To contact the editor responsible for this story: Stephen Voss at sev@bloomberg.net. LONDON, (Reuters) - OPEC oil output has risen in November to a three-year high due to increased supplies from Angola and a further recovery in Libya's production, a Reuters survey found on Tuesday. Supply from all 12 members of the Organization of the Petroleum Exporting Countries is expected to average 30.27 million barrels per day (bpd) this month, up from a revised 29.81 million bpd in October, the survey of sources at oil companies, OPEC officials and analysts found. The survey provides little evidence Gulf Arab OPEC producers are curbing output drastically to make way for Libya, a development consumer-country governments will welcome as oil prices remain well above $100 a barrel. OPEC holds its next meeting on Dec. 14. With oil at $100 plus and Libya's output yet to reach the pre-war rate, analysts and OPEC officials are predicting a low-key gathering unlikely to make major changes to output policy. "OPEC is on standby until they get a bit more clarity on what's happening in Libya and with Libyan exports," said Harry Tchilinguirian, head of commodity markets strategy at BNP Paribas in London. "Generally speaking, the market is in balance," an official from one of OPEC's African members said. "Demand is not dropping that much and prices are likely to stay around current levels." November's total is expected to be OPEC's highest since October 2008, shortly before the group agreed to a series of supply curbs to combat recession, based on Reuters surveys. Brent crude pared an earlier gain after the survey was released and was trading up 95 cents at $109.95 at 1415 GMT. The average price in 2011 is on course to beat 2008's record high of $103.40. The biggest increase in OPEC supply is coming from Angola, where Total's Pazflor field is expanding output. Pazflor is one of several new projects expected to counter a 2011 decline in supplies from Africa's second-largest producer. Output in November also rose due to extra cargoes of crudes including Girassol and Cabinda. In Libya, oil exports and refinery demand have amounted to 500,000 bpd in November, according to the survey, up 150,000 bpd from October but some way short of the production figures given by Libyan officials. Supply in Africa's top producer Nigeria also increased as Royal Dutch Shell's Nigerian venture lifted a force majeure on exports of Forcados oil. But Shell's EA field was shut for maintenance, limiting the supply boost. Saudi Arabia and its Gulf OPEC allies raised production unilaterally after failing at the group's last meeting in June to convince Iran and other members to agree a coordinated increase to meet a shortfall in supplies from Libya. After a reduction in October, Saudi Arabia has increased supplies slightly in November due to higher demand from some customers in Asia, sources in the survey said. Kuwait has also expanded output from an upwardly-revised October total. Nonetheless, sources in the survey have lower estimates of supply than Kuwaiti industry officials, who say the country is pumping 3 million bpd or more. Ahead of December's OPEC meeting, Iran has called for countries that boosted output in the wake of the Libyan war and oil cutoff - effectively the Gulf Arab OPEC members - to reduce output to pre-Libya crisis volumes. Gulf OPEC delegates have said they do not see a need for supply curbs yet but that they will curb output to make way for a recovery in Libyan supplies when it happens, although this will probably be a gradual process extending into 2012. The Gulf Arab OPEC members are typically its most moderate on prices because they do not want high energy costs to restrict economic growth and long-term demand for their main source of export revenue. 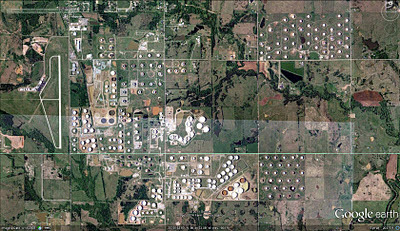 Stockpiles held in floating-roof tanks at the hub dropped 646,000 barrels to 27.7 million, satellite images taken by the Longmont, Colorado-based company show. 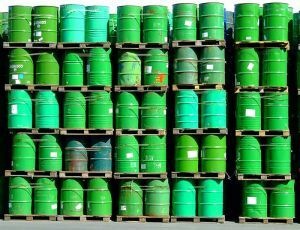 The Energy Department said last week that Cushing inventories, including floating and fixed tanks, totaled 32 million barrels as of Nov. 18. Cushing is the physical delivery point for New York Mercantile Exchange oil futures contracts and the largest crude- trading and storage hub in the U.S. The DigitalGlobe estimate is based on images of 236 operational floating-top tanks at Cushing, the satellite company said. The number of fixed-roof tanks at the hub is 81. The hub has a total capacity of just over 70 million barrels and working storage capacity of about 58 million barrels, according to Andy Lipow, president of Lipow Oil Associates LLC in Houston. Cushing’s floating-roof tanks are used mostly to store crude oil, according to Lipow, who estimates that over 95 percent of the storage volume in the hub is floating tanks. Fixed-roof tanks are for storing petroleum products with lower vapor pressures, such as jet fuel and distillate, he said. 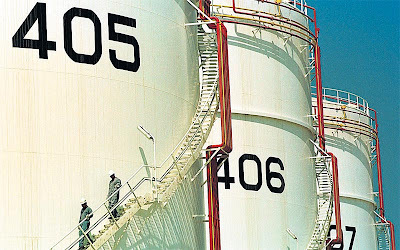 Some fixed-roof tanks in Cushing may have been retrofitted with internal floating roofs and may be used to store crude oil, according to Lipow. DigitalGlobe data is released twice each week at 10:30 a.m. New York time on Mondays and Fridays. For the Friday release, the information is collected from the previous Saturday through Wednesday. For the Monday release, it’s from the previous Thursday or Friday. When clouds obscure the satellite view, data is used from the last day in which there was a full collection. The highest percent of collection data will be used when cloud cover obscures images during a collection period. The Ministry of Finance and Economic Planning has categorically refuted claims in the The New Statesman newspaper that sought to suggest that 4.5 million barrels of oil were missing. inconsistencies in the production figures it published in the 2012 Budget Statement and the figures published by Tullow Oil. 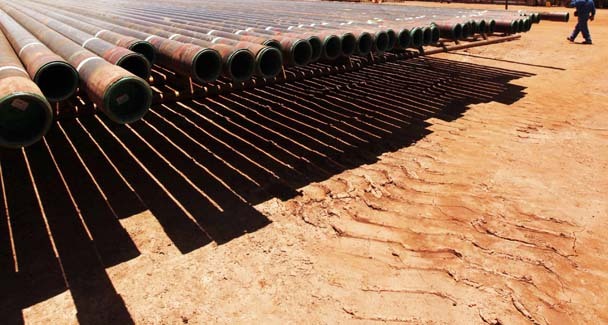 The ministry said it was not true that 4.58 million barrels of crude oil produced from the Jubilee Fields could not be accounted for as alleged by the newspaper. It said the production figures of more than 22 million barrels of oil reported by Tullow in its press release of November 9, 2011 related to the period since the start of production at the end of 2010. “On the other hand the production figure of 17.42 million as stated in paragraph 59 of the 2011 Budget relates to production from January-September 2011,” the statement added. The government of Ivory Coast led by President Allasane Ouattara has mapped out a new maritime border it is sharing with Ghana covering some of Ghana’s jubilee oilfields. 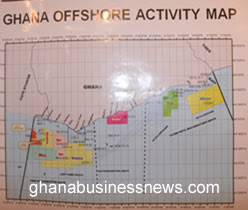 The country has therefore publicly challenged Ghana over title to the offshore acreage hosting some of the region’s most prolific oil and gas fields. 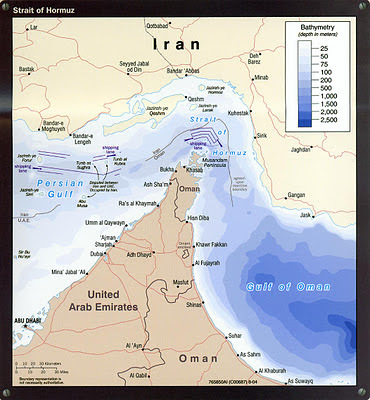 It is believed that the disputed border hold about a billion-barrel discoveries. Upstream news publication reports that officials at state oil company, Petroci, early November 2011 unveiled a controversial map redrawing the maritime border between the two nations, which has been in long-running talks over the disputed area. “This scenario effectively sees the Ivory Coast as laying claim to much of Tullow Oil’s Jubilee, Tweneboa, Enyenra and Owo discoveries, among others, plus the West Tano-1X find and several prospects,” the publication cited an unamed source as saying. 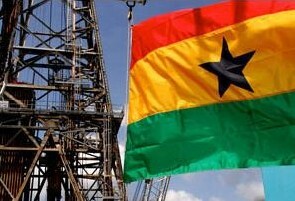 Even though talks between Ghana and Ivory Coast has not been concluded, the publication says Ivory Coast now plans to develop its own gas processing infrastructure, ostensibly duplicating proposals advanced by Ghana, although most believe this move is simply political posturing ahead of a diplomatic solution to the maritime border impasse. Head of the technical committee of the Presidential Commission, Mr. Lawrence Apaalse told ghanabusinessnews.com on the phone Sunday June 26, 2010 that the Ivorians made some proposals to the Ghanaian Commission, but the proposals were not acceptable and they were asked to go back and review it. “We were waiting to hear from them, and then they had the political situation in that country. We have not heard from them since that time,” he said. Although there seems to be a looming diplomatic uproar, Ghanaian officials have painted a picture that the situation is under control and there is no cause for alarm. Ghana’s Energy Minister Dr Joe Oteng Adjei at a press conference in Accra early October 2011 indicated that Ghanaians should not be worried about the border dispute. He made the comment the day President Ouattara paid a day visit to Ghana after assuming power. It was believed that Outtara’s visit to Ghana was on two main issues – first was to get ex-President Laurent Gbagbo’s men hiding in Ghana to be arrested and second was how to solve the border dispute. Meanwhile, the Jubilee Partners have already raised concerns about the boundary problem. Kosmos fears that if changes are made to the maritime boundary demarcation between Ghana and Ivory Coast, it may lose some of its license. It has 18% stake in the Deepwater Tano block in the Gulf of Guinea. The Dzata-1 well and the Deepwater Tano fall within the same boundary. Currently Ghana is the rightful owner of the area, but Ivory Coast has petitioned the United Nations to demarcate the Ivorian territorial maritime boundary with Ghana. Even though the two countries met in April 2010 for negotiations on the matter, Kosmos says the results of the meeting were not announced and the issue remains unresolved at present. (Reuters) - Gold steadied on Tuesday after posting its second-largest one-day gain of the month the previous day, boosted by a stronger euro and a recovery in risk assets such as stocks, with which gold is trading more closely than at any time in the last year. The euro briefly traded at session highs against the dollar after Italy sold three- and 10-year debt ahead of a key meeting of euro zone finance ministers, which investors hope could result in fine-tuning the details for leveraging the European Financial Stability Facility rescue fund. European equities .STOXX turned positive, which helped boost gold. The correlation between the gold price and the European stock market is at its most positive in a year, while the correlation of gold and copper is hovering around its highest since the final quarter of 2010 as well, meaning gold is more likely to move in lockstep with these assets. Spot gold was last quoted up 0.16 percent at $1,714.60 an ounce by 1208 GMT, having risen from an intraday low of $1,703.25. 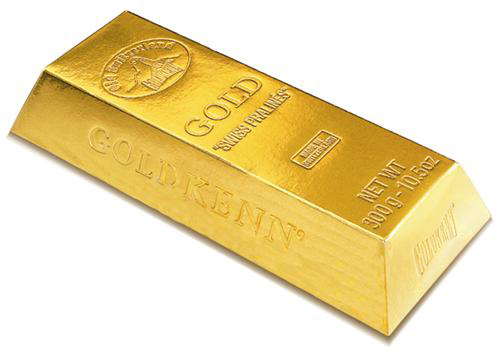 On Monday, gold gained nearly 2 percent, marking the second-largest one-day gain in the price so far this month. "In the short term, we fear gold could go a bit lower actually, but this would be exclusively driven by weaker equity markets and weaker commodity markets, because of the increasing risk aversion," Commerzbank analyst Daniel Briesemann said. "If you have a look further out for the next six, or even 12 months, we think gold is very well supported around its current levels and even more buyers should find gold attractive at these levels," he added. Even though gold has all but ditched its safe-haven label in the last month and behaved like a risk-related asset, investors are snapping up the metal. Gold holdings in exchange-traded funds hit a new record high last week, rising by more than 2.2 million ounces in just one month to 69.993 million ounces, almost equivalent to total mine supply this year, highlighting investor demand for an alternative to currencies, stocks or bonds. So far this year, investor demand for gold has raised ETF holdings globally by nearly 5.0 million ounces. "We remain bullish on gold, because we think the solutions are going to need more aggressive monetary policy, which will be positive for gold," said Jeremy Friesen, a commodities strategist at Societe Generale in Hong Kong. But gold is unlikely to set new highs as trading activity slows ahead of the year-end, with traders booking profits and moving to the sidelines before the holidays. "I wouldn't be surprised that we don't see much strength toward the end of the year, but into 2012 we should see aggressive monetary policy being reflected in prices of gold," Friesen added. Euro zone leaders face increasing pressure from other countries and rating agencies to solve the two-year-old debt crisis, which threatens to split up the single-currency bloc and sink the global economy, causing distress in financial markets. Since hitting a record $1,920.30 an ounce in September, gold has fallen by 10.7 percent, under pressure from the weakness in the euro against the dollar and the growing desire among investors to preserve their wealth with cash rather than hard assets. 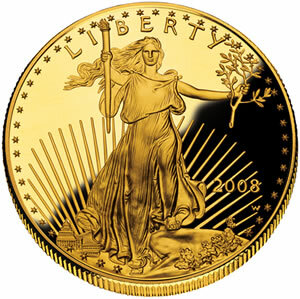 So far in 2011, the gold price has risen by more than 20 percent, set for its eleventh consecutive yearly price gain. In other precious metals, silver was down 0.5 percent on the day at $31.94 an ounce. Platinum was last up almost flat at $1,545.50 an ounce, while palladium was up more than 2 percent on the day at $590 an ounce. * Asian imports set to fall in Dec.
for Angolan grades remained lacklustre. trader, referring to the Nigerian market. unchanged from the previous month, traders said on Friday. YOUNGSTOWN, Ohio (AP) — A rare sight in hard-luck Youngstown, a new industrial plant, has generated hope that a surge in oil and natural gas drilling across a multistate region might jump-start a revival in Rust Belt manufacturing. The product tanker ‘BW Danube’ came under attack by pirates in position 15:51.1N - 055:07.0E on 15th November. Eight pirates in two skiffs chased the vessel while it was underway. The Master raised the alarm, ordered an increase in speed; took evasive manoeuvres and all the crew, except the bridge team, mustered in the citadel. The security team on board the vessel fired flares towards the skiffs as a warning. The pirates fired upon the tanker and finally aborted the attempted attack and moved towards a mother vessel. The dhow mothership was reported to have been intercepted by naval forces and disrupted with the skiffs being destroyed. 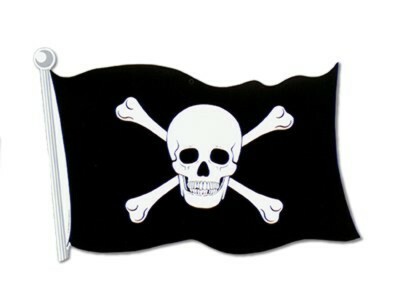 The pirates were removed and the dhow was no longer considered a threat to shipping. There were also reports of several attacks on chemical tankers in the South China Sea last week. Iran has lifted crude from sanctions-hit Syria, the country's first export since late September, and more exports could follow from the country as buyers from India, Russia and China line up vessels. An Iranian-owned entity this week lifted 80,000 tonnes (586,400 barrels) of Syrian crude, consisting 50,000 tonnes of heavy Souedie and 30,000 tonnes of Syrian Light, at Baniyas, the report said, citing trading and shipping sources. Crude oil inventories in Cushing, Oklahoma, rose 0.8% on 17 November from 15 November. 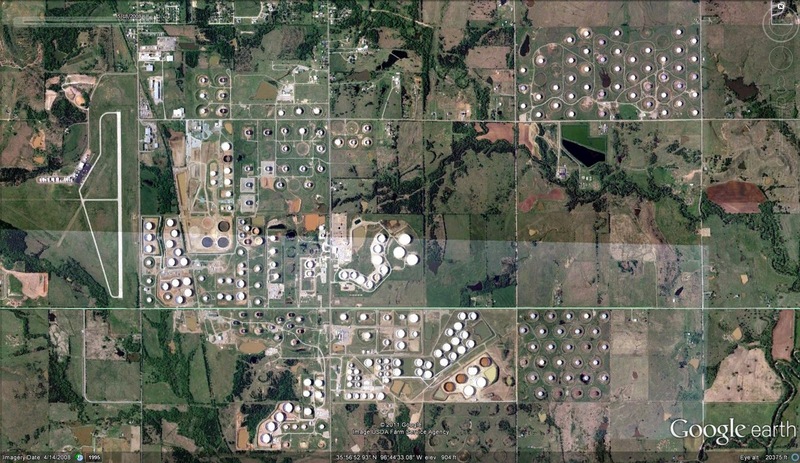 Stockpiles held in floating-roof tanks at the hub gained 224,000 barrels to 28.3 million, satellite images taken by the Longmont, Colorado-based company show. The Energy Department said last week that Cushing inventories, including floating and fixed tanks, totaled 32 million barrels as of 11 November. Cushing is the physical delivery point for New York Mercantile Exchange oil futures contracts and the largest crude- trading and storage hub in the US. The estimate is based on images of 234 operational floating-top tanks at Cushing. The number of fixed-roof tanks at the hub is 81. The hub has a total capacity of just over 70 million barrels and working storage capacity of about 58 million barrels, according to Andy Lipow, president of Lipow Oil Associates in Houston. RIYADH — The world's biggest oil producers are signaling they want OPEC to stick to existing crude-output quotas, as prices have remained lofty. The statements by top oil officials from Saudi Arabia and Iraq and by OPEC's secretary general this week represent a shift in stance. As recently as September, the Organization of Petroleum Exporting Countries hinted in an oil-market report that some members could reduce production if the debt problems plaguing Europe create ripple effects that cut demand and if Libya rapidly resumes exports. Neither has come to pass, and oil prices surged 36% from early October to mid-November. On Tuesday, oil futures gained $1.09, or 1.1%, to close at $98.01 a barrel on the New York Mercantile Exchange. OPEC's reference price, which tracks various crude-oil blends produced by member nations, closely follows the Brent benchmark, which has traded above $100 a barrel for most of the year and on Tuesday jumped 2% to $109.03 a barrel. The nations OPEC comprises control more than a third of the world's oil supply, and the decisions made by the group trickle down into fuel prices paid by consumers. "The market is currently balanced," OPEC Secretary General Abdalla Salem el-Badri told reporters. "Prices are comfortable" for both producers and consumers, he said. Hussain al-Shahristani, Iraq's deputy prime minister for energy, concurred Tuesday, saying OPEC should "roll over," or renew, the production quotas at the next meeting, slated for Dec. 14 in Vienna. Ali Naimi, the oil minister of Saudi Arabia, the world's biggest oil exporter, said he is "very happy" with oil prices. While the recovery of Libya's oil output hasn't put much of a dent in prices, it will remain an issue, though it is unlikely to come to the fore in the next OPEC meeting, said John Hall, a London-based oil-industry consultant. "They can talk about Libya, but they cannot bring a cut, since no one knows when it will actually reach full production," and a new government isn't completely up and running, Mr. Hall said. Libya's interim prime minister on Tuesday unveiled a cabinet, which includes Abdurahman Benyezza, a former Eni SpA executive, as the country's top oil official. OPEC members splintered in June, with some Gulf states advocating a production boost and an Iran-led group opposing the move because of an uncertain economic outlook. Following the demise of those talks, Saudi Arabia and its allies in the more-moderate wing of OPEC boosted output to offset the loss of Libyan crude. In recent weeks, some OPEC voices from Iran and elsewhere have sharpened the rhetoric on the need for Saudi Arabia to cut back. Yet on Sunday, Muhammad Ali Khatibi, OPEC governor for Iran, the country holding the group's presidency, played down the risk of a new clash at the December meeting. Mr. Khatibi had recently called on countries that had increased output to make up for lost Libyan production to cut back on those additional barrels, although he didn't mention any country by name. "The latest figures show the reduction has started," Mr. Khatibi said. Several OPEC insiders say the organization could be girding for tougher negotiations in early 2012 in light of rising output from Libya, Iraq and Angola, especially if the global economy doesn't pick up. Mr. el-Badri said Sunday that OPEC members who increased output to compensate for the loss of Libyan oil should make room for the country's output. In the first half of 2012, demand for OPEC crude is expected to fall by more than 1.3 million barrels a day, compared with the fourth quarter of 2011, to an average of 29.29 million barrels a day, according to the group's latest report. That is lower than OPEC's current production of about 30 million barrels a day. —James Herron contributed to this article. WELLINGTON, New Zealand -- Forty-nine penguins rescued from an oil spill off New Zealand have been freed after being cleaned and nursed back to health by wildlife officials. 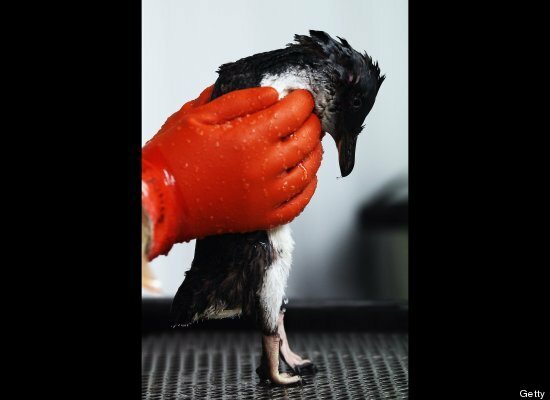 The birds released Tuesday are among 343 little blue penguins that have been cleaned of oil since a cargo ship ran aground on a reef near Tauranga on Oct. 5 and spilled some 400 tons of fuel oil. The penguins were nursed to health at a wildlife facility manned by specialists from New Zealand, Australia and the United States. They were fitted with microchips so they can be monitored after their release. Wildlife Response Manager Kerri Morgan says it's important wild penguins do not remain in captivity for too long because they can develop injuries and illnesses. (Bloomberg) -- The governor of Nigeria’s central bank, Lamido Sanusi, said the contracts for oil companies to conduct deep offshore operations must be renegotiated because the fiscal terms are unfavorable to the West African nation. “Unfair fiscal terms” for the deepwater operations, which account for 40 percent of Nigeria’s oil production, cost the country $5 billion a year in lost revenue, and contribute to the decline of the foreign-currency reserves of Africa’s biggest oil producer, he said. Fuel subsidies, which the government wants to end, total another $6 billion a year, Sanusi said today outside the conference. Foreign-currency reserves dropped 3.7 percent to $32.8 billion on Nov. 4 compared with a year earlier, according to central bank figures. The country imports most of its fuel products because of a lack of refining capacity, and spends foreign currency in biweekly auctions to support the naira. Nigeria receives 20 percent of oil companies’ profits from deep offshore wells, “which is calculated when the oil companies tell us what their expenses are,” Sanusi said. The country is the fifth-biggest source of U.S. oil imports. Royal Dutch Shell Plc, Exxon Mobil Corp., Chevron Corp., Total SA and Eni SpA operate joint ventures with the state-owned Nigerian National Petroleum Corp. that pump more than 90 percent of the West African nation’s crude. Shell spokesman Precious Okolobo and ExxonMobil spokesman Nigel Cookey-Gam declined to comment on Sanusi’s remarks. Total spokesman Charles Ebereonwu, Nigerian Agip Oil Company Ltd. spokesman Tajudeen Adigun and Chevron spokesman Femi Odumabo didn’t answer telephone calls seeking comment. The Nigerian government is pushing to renegotiate the terms with the companies through the Petroleum Industry Bill, Sanusi said. The proposal for changing oil industry regulation has been in the legislature for more than two years, stalling new projects in the industry as producers including Shell and Total hold off on investment until the law passes. “I don’t talk to companies, I don’t care what they think,” Sanusi said when asked how oil companies will react to such changes in their contracts. The central bank has struggled to keep the naira within its target band of 3 percent above or below 150 per dollar as oil prices declined and demand for imports surged. Mounting demand for dollars had pushed the naira outside the target range, with the currency weakening to a record 166.6 per dollar on Oct. 10. Cash strapped General Maritime Corp (GenMar) filed for relief under Chapter 11 of the US Bankruptcy Code in the US Bankruptcy Court for the Southern District of New York on 17th November. Most of the company's subsidiaries – with the exception of those in Portugal, Russia and Singapore, as well as certain inactive subsidiaries– have also commenced Chapter 11 cases. GenMar announced that it had reached agreements with its key senior lenders, including its bank group, led by Nordea Bank Finland, New York Branch as administrative agent, as well as affiliates of Oaktree Capital Management, on the terms of a financial restructuring to strengthen the company's balance sheet and enhance its financial flexibility. The restructuring agreement and related equity commitment letter have the support of over two thirds of the company's obligations from its banks and Oaktree, GenMar claimed. Among other things, under terms of the agreements, Oaktree will provide a $175 mill new equity investment in GenMar and convert its prepetition secured debt to equity. Under the terms of the agreement, GenMar expected to substantially reduce its funded indebtedness and enhance its liquidity profile. Operations were expected to continue without interruption, the company stressed. In conjunction with the Chapter 11 filing, GenMar received a commitment for up to $100 mill in new debtor-in-possession (DIP) financing from a group of lenders led by Nordea. The initial amount of the DIP is $75 mill, however, the credit facility contemplates that, if needed, the company will have access to another $25 mill of future financing, subject to the applicable lenders' agreement, certain other conditions and further order of the Bankruptcy Court. Upon approval by the Bankruptcy Court, the new financing, combined with cash generated from the company's ongoing operations, will provide substantial liquidity, be used to support the business during the restructuring process and prevent customer interruption. GenMar pointed out that it anticipated that it will continue to meet its obligations going forward to its customers, vendors and employees. CFO Jeffrey Pribor, said, "We are very pleased to have reached these agreements with certain of our key senior lenders, which we believe underscore their confidence in our business and represents an important step forward for our company and provides for a commitment of liquidity. “Our operations are strong, but continued macroeconomic weakness and reduced tanker rates have diminished our cash flow and our ability to comply with certain covenants under our debt instruments. We are taking appropriate steps to align our capital structure, which was put in place under a different economic climate, with the realities of today's markets and economy. “Having reviewed the options available, we determined that implementing these agreements with our key lenders through court-supervised proceedings will facilitate our financial restructuring and that this is the best course of action for General Maritime. This restructuring process will allow us to continue to support our customers, suppliers and employees while we work to enhance the company's position as a leading provider of international seaborne oil transportation services. "We look forward to working together with our creditors to complete a successful financial restructuring. General Maritime owns and operates one of the world's largest and most diverse fleets of tankers and we remain committed to safely and efficiently serving our customers. We appreciate the ongoing dedication of our employees, whose hard work is critical to our success and the future of our company. We also thank our customers, suppliers, lenders and business partners for their support as we work to position General Maritime for profitable growth," concluded Pribor. The restructuring agreement contemplates the negotiation of definitive documents by December 2011 and provides that the transaction be implemented pursuant to a Chapter 11 plan for GenMar that must become effective by April 2012. Each party has agreed that the company may continue to seek alternative equity commitment proposals pursuant to the restructuring agreement in accordance with its fiduciary duties. As such, the company may continue to solicit, respond to, and negotiate the submission of alternative equity commitment proposals as part of its Chapter 11 case. The terms of the restructuring are subject to definitive documentation and approval by the Bankruptcy Court, among other conditions. Accordingly, no assurance can be given that the transactions described herein will be effected, the company warned. Surging crude output in the Bakken shale formation is set to make North Dakota a bigger oil producer than OPEC member Ecuador. The CHART OF THE DAY tracks North Dakota’s production, which has almost doubled in the past two years, as Ecuadorean output has stagnated. North Dakota and neighboring Montana are home to the Bakken Formation, identified by the U.S. Geological Survey in 2008 as having as much as 4.3 billion barrels of recoverable oil. Companies extract the oil with hydraulic fracturing, a technique that shoots water, sand and chemicals into shale. North Dakota pumped a record 464,129 barrels a day in September, the most recent month with available data, according to the state government, up from 86,072 barrels 10 years earlier. The state is now the fourth-biggest producer in the U.S. after Texas, Alaska and California, according to the Energy Department. Ecuador produced 485,000 barrels a day in September, according to a monthly Bloomberg News survey of oil companies, producers and analysts, near the top of its range for the past four years. It was OPEC’s smallest producer until Libya’s production was disrupted this year by the insurrection that toppled Muammar Qaddafi. Oil-tanker companies may demolish the most ships since 2003, lifting charter rates from their lowest in at least 14 years, as values of older vessels trade 36 percent above the price of scrap. The cost of 15-year-old tankers fell 48 percent to $23.5 million this year as scrap values advanced 3 percent to $17.25 million, the narrowest gap in at least five years, according to data from the world’s two largest shipbrokers. Owners may break up 5 percent of the fleet within 18 months, the most in nine years, said Michael Pak, an analyst at Clarkson Capital Markets LLC in Houston. While scrapping would reduce the glut and raise rates, it won’t be enough to make ships profitable. Freight derivatives, traded by brokers and used to bet on future rates, anticipate a 68 percent jump to $12,817 a day in 2013 compared with the average so far this year. That’s still 43 percent of what Frontline Ltd., the biggest operator, says it needs to cover costs. Sixteen months of unprofitable charters and falling ship values are lowering expectations from as recently as three months ago, when analysts anticipated fewer demolitions. Owners scrapped 8 percent of the very large crude carrier fleet in 2003, according to Clarkson Research Services Ltd., a unit of Clarkson Plc, the world’s biggest shipbroker. Rates surged 87 percent to $98,323 the following year, its data show. Single-voyage rates for very large crude carriers, hauling about 20 percent of the world’s oil, averaged $7,627 a day this year, compared with $32,006 in 2010, according to the London- based Baltic Exchange, which publishes costs along more than 50 maritime routes. Rates settled at $12,200 yesterday. Longer-term contracts are also unprofitable, with a 15-year-old tanker earning $16,000 a day on a one-year accord, according to London- based Clarkson. Vessels in service since 1996 or earlier comprise 14 percent of the global fleet, which expanded 11 percent to 554 ships since the end of 2008, according to data from Redhill, England-based IHS Fairplay. Owners ordered the most new vessels in four decades in 2007 and 2008, when returns in the spot market were 14 times higher than now. Hamilton, Bermuda-based Frontline will report its first annual loss in nine years for 2011, analyst estimates compiled by Bloomberg show. 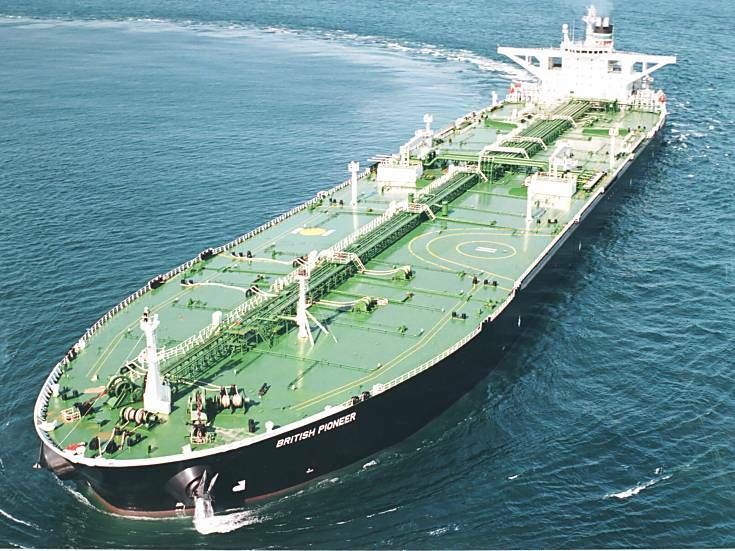 Owners will probably start demolishing older double-hulled tankers before the end of this year, said Jens Martin Jensen, the Singapore-based chief executive officer of Frontline’s management unit. It would be the first time for the vessels, built with an extra layer of steel to reduce the risk of spills, according to IHS Fairplay. 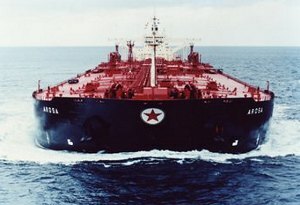 Frontline’s fleet includes three double-hulled tankers built in 1995. Scrapping may be postponed should earnings improve. Daily rates on the benchmark route to Japan from Saudi Arabia jumped 19-fold to $10,479 last week after oil companies and traders booked the most tankers to load Persian Gulf cargoes in at least seven years, according to data from Galbraith’s. That’s 65 percent below Frontline’s break-even level. China’s economy accounts for about 10 percent of oil consumption and will expand 9 percent next year, or more than twice the speed of global growth, according to the International Monetary Fund. World crude demand will rise by about 1.3 million barrels to 90.5 million barrels a day in 2012, the Paris-based International Energy Agency estimates. The gain is equal to about 237 additional cargoes for the largest tankers. Rising returns may encourage shipping companies to sail faster, effectively increasing the number of ships competing for business. The average VLCC is proceeding at 10.4 knots, compared with as much as 12.2 knots in 2008, according to data compiled by Bloomberg. Owners cut speeds when rates decline to limit fuel costs. Freight derivatives indicate the past week’s gains won’t be sustained. While the December contract trades at $15,117 a day, 24 percent more than now, rates are projected to decline for the next few months to $8,245 by April, according to data from Marex Spectron Group, a London-based broker of the contracts. The slump in tankers is being mirrored in ships carrying other commodities and manufactured goods. Daily rates for capesizes, hauling iron ore and coal, averaged $13,839 this year, below the $20,000 they need to break even, Baltic Exchange data showed. An index reflecting charges for six types of containers fell 38 percent since the start of April, data from the Hamburg Shipbrokers’ Association showed. Shares of Frontline slumped 77 percent this year in Oslo, reducing its market value to 2.66 billion kroner ($466 million) from 27.7 billion kroner in June 2008. The company will report a net loss of $112.7 million for this year, the worst result since at least 1996, according to the mean of 19 analyst estimates compiled by Bloomberg. The MSCI All-Country World Index of equities retreated 8.1 percent since the start of January. Double-hulled tankers that were 15 years old were sold for as much as $114 million in 2008, according to data from London- based Simpson, Spence & Young Ltd., the second-largest shipbroker. The incentive to demolish the ships now may be higher than suggested by the narrowing premium to scrap. Clarkson’s assessment of the demolition value is based on single-hulled tankers. Those with double hulls would be worth more because they yield more steel, said Calum Kennedy, an analyst at the shipbroker’s research unit in London. The vessels also need surveys of seaworthiness every five years, which can cost $1 million to $2 million, potentially adding to costs for buyers of older transports, said Pak in Houston. Bangladesh handled 78 percent of all crude and oil-product tanker scrapping in 2009, followed by Pakistan with 10 percent and China with 8 percent, according to the latest data from the United Nations Conference on Trade and Development. Anyone buying an older tanker may also have more difficulty in winning cargoes. 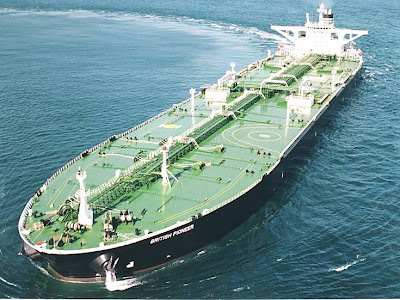 Oil companies are increasingly favoring newer vessels, which tend to be better maintained, said Per Mansson, the managing director of Norocean Stockholm AB, a shipbroker in the Swedish capital. Ghana is targeting a total revenue of GH¢1.23 billion ($768 million) from the sale of crude oil in the 2012 fiscal year, according to government’s 2012 budget presented to Parliament November 16, 2011. This is based on an estimated average oil price of $90.00 per barrel and production of 90,000 barrels per day, text of the budget presented by Finance and Economic Planning Minister Dr. Kwabena Duffour stated. “…the total revenue from crude oil sales in 2012 fiscal year is projected at GH¢1,239.82 million based on an estimated average oil price of $90.00 per barrel and production of 90,000 barrels per day,” said Dr Duffour. Government, when seeking approval for a supplementary expenditure for 2011 in Parliament Thursday July 14, 2011, indicated that it was expecting to earn revenue of GH¢1,250.8 million from oil in 2011 based on the new oil price assumption of $100 per barrel as well as the revised estimated average oil production of 84,737 barrels per day as well as a new exchange rate assumption. But partners at the Jubilee oil fields such as Kosmos Energy and Tullow have revised downwards oil output for 2011. According to Tullow, November 9, 2011, production for 2011 will average 79,000 to 81,000 barrels of oil per day, down from the 82,000 to 84,000 barrels forecast in August 2011. Kosmos Energy, in its 2011 third-quarter results released November 10, 2011 said the Jubilee Phase 1 wells are producing about 80,000 barrels of oil per day. This means that government’s targeted revenue for 2011 from oil sales cannot be met. (Bloomberg) -- Gold demand rose 6 percent in the third quarter from a year earlier as Europe’s debt crisis spurred investors to accumulate the metal as a protection of wealth and push prices to a record, the World Gold Council said. Global demand gained to 1,053.9 metric tons worth a record $57.7 billion, the London-based industry group said today in a report. Investor purchases of exchange-traded funds and products, bars and coins outpaced a drop in jewelry demand and increase in recycled supplies, the council said. Gold climbed to a record $1,921.15 an ounce in London on Sept. 6 and is heading for an 11th consecutive annual increase. Holdings in bullion-backed ETPs yesterday were within 1 percent of the all-time high in August as concerns about Europe’s debt crisis and slowing economic growth boosted demand. European bar and coin demand topped that in India or China, the council said. Gold for immediate delivery traded at $1,769.77 an ounce at 4:24 p.m. yesterday in London. Prices averaged about $1,706 in the third quarter, up 39 percent from a year earlier and 13 percent higher than the second quarter. Investment jumped 33 percent to 468.1 tons in the latest quarter. Bar and coin purchases increased 29 percent to 390.5 tons. The bar and coin demand in Europe more than doubled to 118.1 tons from 50.3 tons a year earlier and was the most since the fourth quarter of 2008, according to Grubb. The average demand in Europe since 2005 is 10 tons a quarter, he said. The data for Europe covers France, Germany, Switzerland, U.K., Spain, Benelux, Italy and Scandanavia. ETP holdings gained 81.7 tons in the period, compared with 32 tons a year earlier, data compiled by Bloomberg show. Investors owned 2,314.4 tons in the products as of yesterday, more than all but four central banks. Assets reached a record 2,330 tons on Aug. 18. Billionaire investor John Paulson cut his holdings in the SPDR Gold Trust, the biggest gold-backed ETP, by 36 percent to 20.3 million shares in the third quarter, government filings showed this week. Jewelry demand fell 10 percent to 465.6 tons in the third quarter, the council said. Usage in India fell 26 percent to 125.3 tons, and the country and China accounted for 57 percent of global purchases, according to the report. Total gold demand fell 23 percent in India and rose 17 percent in China. India’s bar and coin purchases totaled 78 tons in the quarter, compared with China’s 62.2 tons. China’s demand for those assets had overtaken India’s in the first quarter. Central-bank and government-institution purchases jumped more than sixfold to 148.4 tons in the quarter, the council said. Central banks may buy 450 tons for this year, signaling about 100 tons will be purchased in the fourth quarter, Grubb said. The demand is centered on central banks in Latin America, central Asia and the Far East, he said. Total supply increased 2 percent to 1,034.4 tons in the quarter from a year earlier as recycled output rose 13 percent to 426.5 tons, the council said. Mine output gained 5 percent to 746.2 tons, it said. To contact the editor responsible for this story: Claudia Carpenter at ccarpenter2@bloomberg.net. ABUJA (Reuters) - Nigerian President Goodluck Jonathan on Wednesday changed top management at regulators overseeing Africa's biggest oil industry, a body criticised in the past by international agencies for a lack of transparency. Reginald Chika Stanley, who currently works within the state-oil company, becomes executive secretary of the Petroleum Products Pricing and Regulatory Agency (PPPRA), a statement from the presidency said. PPPRA is in charge of paying fuel subsidies to importers. Subsidy payments on petrol imports, which Nigeria says costs the government over $7 billion a year, are due to be scrapped beginning next year. Jonathan also approved the appointment of Osten Oluyemisi Olorunsola, currently vice president at Shell Upstream International, as head of the Department of Petroleum Resources (DPR). The DPR is in charge of regulating Africa's biggest oil and gas business and has been involved in organising licensing rounds in the past. Its the largest yellow diamond ever sold - and now might become one lucky girl’s best friend. The precious gem, called the Sun-Drop Diamond, was sold to an anonymous buyer for almost 11 million dollars at Sotheby's annual jewelry auction in Geneva. BBC reports the gem is 110-carats - and “about 100 times heavier than most diamonds you see in rings and necklaces." The fancy jewel was sold by Cora International, which discovered the diamond in South Africa last year. Then it travelled to Hong Kong and at London's Natural History Museum earlier this year where American model Jerry Hall showed it off. Indeed - it was the eighth most expensive diamond ever sold at auction. This -- after Sotheby's sold a fancy intense pink diamond last year for a record-breaking $46 million. A journalist for the BBC says it’s proof that the global economic crisis hasn’t undermined the luxury jewels market. Two companies have announced multimillion-dollar plans to expand oil storage and transport capacity along the Houston Ship Channel to better handle the nation's growing crude oil production. Oiltanking will add 1 million barrels of oil storage capacity at its Houston facility, part of an $80-$85 million (€59-€62 million) expansion. And Kinder Morgan revealed plans to build a $400 million oil storage terminal on the Houston Ship Channel, including 52 storage tanks with total capacity of 6.6 million barrels, as part of a joint venture with TransMontaigne Partners. 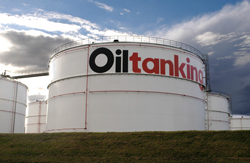 Oiltanking is seeking to capitalise on rising crude supplies from US shale formations and Canadian oil sands, Oiltanking CEO Carlin Conner says. ‘In anticipation of these new crude supplies being delivered to the Houston market, we are expanding and strengthening the premier crude oil distribution system in the Houston Ship Channel,’ Conner says. The project, slated to be completed in early 2013, includes construction of 16 miles of new pipe and reversal of some existing pipe, according to the company. The additions expand Oiltanking's active Houston storage capacity to 18.8 million barrels. The Battleground Oil Speciality Terminal Company, the joint venture between Kinder Morgan and TransMontaigne, will construct a terminal to handle low-grade oil and residual fuel used by ship engines and industrial plants. 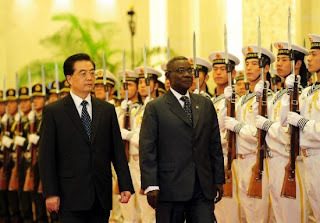 The President of Ghana, John Evans Atta Mills, intends to pull Ghana out of the International Monetary Fund in a final bid to end moves by the Christine Largarde-led funding agency to suffocate the US$3 billion loan the NDC government wants from the China Development Bank (CDB). News of the president’s unwavering stance on the US$3 billion Chinese loan made it into the newsroom of The Globe newspaper as a powerful delegation of lawmakers from the People’s Republic of China flew into Ghana last week for an official visit, that also saw them visit Ghana’s Parliament – the arm of government that approved the controversial 3 billion dollar loan. With just a little over a year left of its four-year mandate, and following what appears to be deep-seated challenges that have crippled the roundly marketed STX housing project, analysts say the Mills government badly needs huge foreign capital injection if it is to honour a string of mouth-watering campaign promises on whose back it rode to political power in January 2009. In a clear case of defiance of the IMF’s directives, President Mills is said to have given firm instructions to the Minister of Finance to, as our government source put it, “ensure everything lawfully, politically and diplomatically possible is done” to save the mega loan agreement between Ghana and the China Development Bank. “And, by this I mean, even if it involves walking out of the IMF,” the source added. “We have already suffered collapse of the STX Housing project. Many in this government believe therefore that a second term for the President is inextricably linked to the 3 billion dollar loan. That is why he is determined to see it materialise and not even the IMF can stand in his way,” said the source, who works in the office of the President. The IMF supports Ghana largely to fasten its macro-economic indicators to achieve the stability needed for business planning and growth. Under President Mills’ predecessor’s administration, Ghana did wean itself off IMF support in line with an announcement made by President John Kufuor in September 2005 during a meeting with Dr Abbas Mirakhor, then Executive Director for Ghana at the IMF. 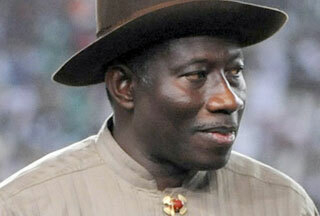 He also explained that government’s decision did not mean the country was severing its relationship with the Fund. He explained that Ghana was to remain a member and a shareholder as well as maintain policy dialogue with the IMF, except that the structure of the relationship would change. But, after taking over as President in January 2009, Professor Mills, citing a “mismanaged economy” and an “empty” national kitty, turned to the IMF and the World Bank for support, despite opposition criticisms. It follows IMF’s resolute stance at a recent meeting with Ghanaian officials that it will not allow Ghana to contract huge loans that violate its rules and guidelines so long as the nation continues to receive the fund’s support under the current Extended Credit Facility agreed with the Ministry of Finance in May 2011. LONDON—Waha Oil Co., the last major Libyan oil company yet to resume production, is set to pump crude again next month after a management change ended a crippling strike, an official at the company said Tuesday. 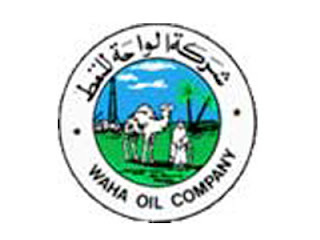 Khaled Othman, a Waha Oil Co. construction supervisor and one of the strike's leaders, said, "We will go back Saturday to the field, [and] I am confident [production] will start sometime in December." Othman and other Libyan officials said employees are coming back to work after new chairman Ahmed Ammar took charge at the company. Workers had gone on strike in September to protest the leadership of Waha's then-chairman Bashir Elashahab, who allegedly had ties to the regime of strongman Col. Moammar Gadhafi. Before Libya's conflict, which ended with the death of Gadhafi last month, Waha Oil produced more than 350,000 barrels of crude oil a day—over 20% of the country's production. But the end of the strike at Waha is lifting a key hurdle to the ramp up of Libyan oil production, which has already resumed faster than expected after the war brought it to a standstill last February. The company's fields are partly owned by Marathon Oil Corp. , ConocoPhillips and Hess Corp. --the largest Libyan oil operation with ties to foreign companies. Representatives for Hess and ConocoPhillips declined to provide a time frame for the resumption of production. ConocoPhillips said it "will resume operations when the business and security environments are able to support them." LISBON (Reuters) - Angola expects to increase oil output to 1.84 million barrels per day in 2012 from 1.6 mbpd this year, helping the economy expand by 12.8 percent, according to a draft 2012 budget whose main guidelines were approved by parliament on Tuesday. Oil output in Angola, which is Africa's second-largest crude producer after Nigeria, has come in below estimates this year due to technical problems and field maintenance, forcing the government to slash its economic growth forecast to 3.4 percent from 7.6 percent. However, it expects oil output -- which represents over 90 percent of the country's export revenues -- to recover next year as fields come back on line and new projects begin production. "Compared with the budgets of the last three years, this budget proposal assumes a more promising scenario for the national economy," Finance Minister Carlos Alberto Lopes told parliament during a session broadcast by state TV channel TPA. According to the draft budget, total oil production for 2012 is forecast at 663 million barrels, up from 584 million barrels this year and reaching the highest level since 2009 when the country produced 1.8 mbpd. Oil minister Jose de Vasconcelos said the country was producing 1.75 mbpd in late October. Still, the government said it has used a "conservative" assumption for oil prices next year, putting the mark at $77 per barrel, lower than the $95 it had estimated for this year and the current Brent crude market price of around $112. The cautious approach is designed to ensure it can execute public spending plans, the government said. The administration is aiming for a balanced budget in 2012 after an expected surplus this year, as it plans to step up spending on health and education. Revenues are forecast at around 4.42 trillion kwanza, with government spending matching that value. Oil has helped Angola pick up the pieces after a long civil war ended in 2002 but reliance on the commodity has left it vulnerable to oil price drops and global economic weakness. 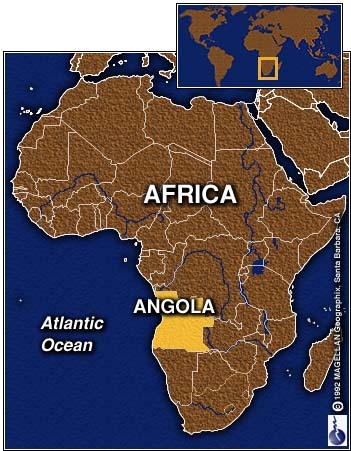 Angola's economy was hit hard when crude prices began to drop in 2008 with its growth rate slowing sharply to 2.4 percent in 2009 after five years of double-digit expansion. Finance Minister Lopes said the government's forecasts for 2012 take into account uncertainty in the world economy. "(The positive scenario) takes into account the solid position of our foreign reserves and public finances, as well as good results in controlling inflation," Lopes said. "But there are also provisions for risks linked to current uncertainties about the outcome of the sovereign debt crisis in Europe and the performance of the U.S. economy," he added. The ruling MPLA party's large majority approved the main guidelines of the budget bill, with the final vote set for mid-December. The measure is likely to sail through parliament. LONDON,(Reuters) - Three extra tankers of Nigeria's Bonny light crude oil stream are due to load in December, traders said on Tuesday, adding nearly 3 million barrels to the loading programme. The three extra cargoes of 950,000 barrels each are expected to load Dec. 8-9, 15-16 and 25-26, although traders said that they are waiting for final confirmation of dates. The volumes amount to around 92,000 barrels per day and were allocated to Nigerian energy group Oando, trading house Vitol and Nigerian oil group Sahara, traders said. "These are injection cargoes. They were probably there all along, just not put in the original programme," said a west African oil trader. 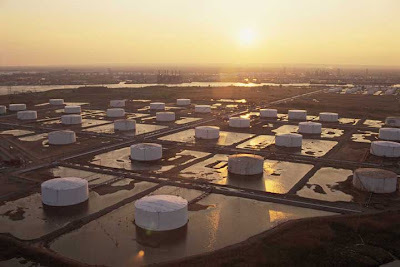 The revisions to the December programme left planned Nigerian supplies at 1.99 million barrels per day (bpd) and the highest forecast level since September, Reuters data showed. The original loading programme forecast exports of 1.9 million bpd. Monthly oil loading programmes are often subject to change since they are based on production forecasts. Bonny supplies have been variable in the past few months due to supply disruptions, prompting operator Royal Dutch Shell to declare force majeure in August. The extra supplies were offset by lower expected volumes of the other main Nigerian grade Qua Iboe. A tanker of the Qua Iboe grade has been dropped from the programme and at least one other cargo has been delayed, traders said on Monday. Operator Exxon Mobil declined to comment. Nigeria is Africa's top oil exporter and its high quality light, sweet crude oil is exported to Asia, Europe and the United States.